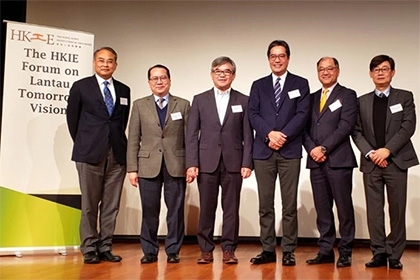 (17 January 2019, Hong Kong) The Hong Kong Institution of Engineers (HKIE) organised The HKIE Forum on Lantau Tomorrow Vision at The Hong Kong Polytechnic University on 15 January 2019. The Forum aimed at facilitating an in-depth understanding of the Lantau Tomorrow Vision promulgated by the Administration among members, and to provide a platform for exchange views on various issues/concern related to the engineering profession in Hong Kong. The Forum commenced with an opening remarks given by Ir Ringo Yu Shek-man, President of the HKIE. In his speech, Ir Yu emphasised that reclamation has played a significant role in the development of Hong Kong, and that the engineering industry has substantial experience in reclamation projects. Ir Yu further encouraged engineers to be more proactively engaged in the planning of the future of Hong Kong, and exploit their expertise and employ modern engineering technology to tackle various challenges in creating new land for the benefit of the society of Hong Kong. “The Institution always advocates for developing Hong Kong under the overriding aims of enhancing the living quality and livelihood of the citizens as well as facilitating sustainable development for our economy and society,” Ir Yu added. Mr Michael Wong Wai-lun, Secretary for Development of the HKSAR Government, and Ir Janson Wong Chi-sing, Deputy Head of the Sustainable Lantau Office (Works) of the Civil Engineering and Development Department of the HKSAR Government, gave presentations on Lantau Tomorrow Vision. A question-and-answer session was moderated by Ir Edwin Chung Kwok-fai, Vice President of the HKIE, during which the participants discussed the various challenges and opportunities in different aspects such as the site selection study, engineering technology, talent development and sources of reclamation material of the proposed megaproject. It was highlighted that the manpower shortage of the engineering industry has been gradually alleviated; nevertheless, youngsters are encouraged to join the sector and take part in pathing the development of Hong Kong. Valuable exchange of ideas and knowledge was facilitated. The Forum was well-attended by some 200 members of the Institution with overwhelming responses. Through the Forum, President Ir Yu considered it a valuable opportunity for members to exchange ideas and knowledge on the topic, and to gain more holistic understanding of the Vision as well as their roles and contributions as engineers in the project.